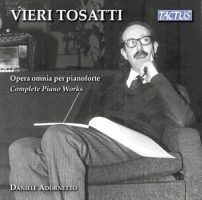 “Complete Piano Works.” Vieri TOSATTI: Tre studi da concerto (1943); La Sonata del Sud (1944); Allegro da concerto (1946); Deutsche Sonate (1970); Sette Preludi e Fughe (1977). Daniele Adornetto (pno). Tactus TC 922201 (1 CD) (http://www.tactus.it/). If the Roman composer Tosatti (1920-99) is encountered today, it is perhaps as Scelsi’s transcriber who momentarily popped up to claim a greater share of attribution. His piano works reveal independence and only a slight consideration of the century’s biggest trends. Serialism and atonality seem not to have appealed, however it sounds like he explored different scale systems as polytonal and octatonic ideas filter through. During the 1950s he created several successful operas, and a dramatic work, Partita a Pugni (1953), about a boxing match. The three Concert Etudes suggest that Tosatti may have started with improvisations. Certainly the ideas flow freely and effortlessly. The composer premiered these pieces in 1944 “in a political, clandestine venue.” With expansive gestures, the Sonata of the South is an autobiographical farewell to a girlfriend heading home. The notes tell us that the last movement, Fat and Drunk, offers quotations, including a bit of Schoenberg. The Allegro da concerto is fast-paced, polytonal and capricious with elusive tonality. The preludes and fugues are strictly conceived, and also the most avant-garde. A lurking question is whether Scelsi is anywhere present, and judging from these pieces, it appears that Tosatti is very much his own man. He did refuse honors and job offers. These pieces are neither spectralist nor mystical, and Tosatti does not limit himself to a narrow gamut of pitches. There may be similar figurations or gestures, but these are perhaps coincidental. The German Sonata’s opening tremolo accompaniment narrowly suggests Scelsi, except of course for the harmonic motion and the chordal melody. Reflecting Tosatti’s admiration of German culture, this three-movement sonata is the best example of Tosatti’s gritty, polytonal style. Kudos to Adornetto for setting a high bar. “Piano Works.” Giacinto SCELSI: Suite No. 9, “Ttai” (1953). Biagio PUTIGNANO: Terracromìe (2011). Davide ANZAGHI: Due Intermezzi (1983); Son’Ora (2014). Giusy Caruso (pno). Tactus TC 930001 (1 CD) (http://www.tactus.it/). This program was recorded in Scelsi’s Roman apartment on December 11, 2014. 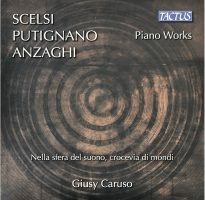 Caruso plays Scelsi’s own Bechstein model A which dampens the material. The playing is forthright. She resists the Suite’s amateurish and improvisatory quality. Ttai’s nine movements (“A succession of episodes alternately expressing Time… and Man…”) hover out of focus, slightly unreachable. Modern pianos make Scelsi crisper, less mysterious. With this instrument, Caruso takes to heart Scelsi’s dictum: “This suite should be listened to and played with the greatest inner calm. Nervous people stay away.” Of course this doesn’t mean there isn’t abounding conflict or energy. Putignano’s trio – “Luminso di ricordi,” “Rosso, nascosto nell’aria” and “Fresco, ricolmo d’azzurro” – explores a bright tessitura of quick tremolos, flashing gestures and twittering birds. The collection aptly matches Scelsi, even though it reminds us that other composers combine harmony and thematic repetition. Anzaghi’s two Intermezzi are nostalgic arabesque sweeps. Son’Ora was written for a pianist who also plays percussion, in this case Scelsi’s own instruments (bells, drums, rattles, gongs, etc.). An unsettling procession of pauses, rapid motives, intersecting percussion and repeated chords seeks to inhabit and extend Scelsi’s aura. Domenico ZIPOLI: Sonate d’intavolatura per Organo e Cimbalo: Four Suites and Two Partitas (1716). Giovanni Nesi (pno). Héritage HTGCD 298 (1 CD) (http://www.heritage-records.com/). Zipoli (1688-1726) might have the unusual claim to have been forgotten on two continents. The Italian Jesuit worked briefly with Alessandro Scarlatti in Naples, and published a two-volume collection of keyboard works in 1716, Sonate d’intavolatura per Organo e Cimbalo, before heading to South America the following year. He wrote sacred music in the new world, cherished by the indigenous population, and since “rediscovered” and performed on Latin American Baroque music programs. His keyboard suites are accomplished, and delightful, standing up enthusiastically to D. Scarlatti and Bach, despite conservative harmonies. 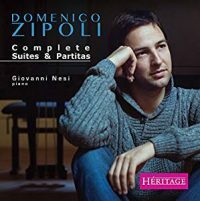 Nesi offers the first complete piano traversal of the “Cimbalo” half of Zipoli’s Roman keyboard publication, and keeps to the original ordering: Suite No. 1 in B minor, Suite No. 2 in G minor, Suite No. 3 in C Major, Partita in C Major, Suite No. 4 in D minor, Partita in A minor. There will be those who would prefer to hear these pieces on an older instrument, but Nesi makes a persuasive case for modern piano, using bold Romantic phrasing and sensitive pedaling. At several places, as befits the period, Nesi ornaments repeats. “Complete Piano Music. Vol. 1.” Camillo TOGNI: Tre Capricci, Op. 38 (1954, 1956, 1957); Per Maila (1982); Aforisma (1985); Seconda Partita Corale: Trascrizione per pianoforte di cinque prelude corali per organo di J.S. Bach (1976); Tre Preludi, Op. 28 (1947); Ricercare, Op. 28b (1947); Fantasia, Op. 25 (1944). Gustav MAHLER: Adagietto from Symphony No. 5 (1901-02; arr. TOGNI, 1973). Aldo Orvieto (pno). Naxos 8.572990 (1 CD) (http://www.naxos.com/). Togni (1922-1993) drew influences from many places, as this Naxos series documents. The first track opens us onto Darmstadt boldness in the first of three Capricci which could be Stockhausen or Goeyvaerts or Boulez. The remaining two come from later years, and they grow calmer with events spread across greater distances. 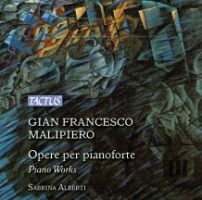 Jumping decades ahead, Per Maila (Fabbriciani’s daughter) returns to a Bergian world-weary twisted tonality, and Aforisma is but 22 seconds of atonal fusillades. The Mahler Adagietto transcription is incredibly unusual in that it does not attempt to overwhelm, but instead captures the fleeting piquant and dissonant moments. Here and there it sounds as if Togni has misread the score, or has introduced lingering notes. Others may conceive of an arrangement that uses pedal, but Togni applies it warily. This Mahler does not gush; Visconti would have been unimpressed. Mahler’s notes become points handled like atonal momente. Berg is visible among the glinting sharp angles. 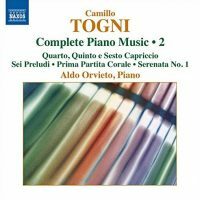 Togni fashioned two suites with transcriptions of Bach organ preludes. In this second Partita Corale there are strange harmonic holdovers not unlike the Mahler treatment, though softer, but still unexpected. Bach is still here but slightly adjusted – perhaps with Neo-Classical touches or momentarily modern air shafts. The three Preludes show a debt to Schoenberg, but the Ricercare would not exist without Bach despite its atonality. The meandering Fantasia dates from the mid-1940s when Togni had not quite found his own voice, but was working at economizing material. “Complete Piano Music. Vol. 2.” Camillo TOGNI: Quarto Capriccio, “Ottave” (1969); Quinto Capriccio, “Omaggio a Bellini” (1987); Sesto Capriccio, “Aforisma sul nome di Sylvano Bussotti” (1991); Sei Preludi, Op. 21 (1944); Prima Partita Corale: Trascrizione per pianoforte di cinque prelude corali per organo di J.S. Bach, Op. 29 (1949); Serenata No. 1, Op. 10 (1940). Aldo Orvieto (pno). Naxos 8.572991 (1 CD) (http://www.naxos.com/). The three Capricci here continue the series presented in Vol. 1: Ottave is atonal, but rehabilitates the octave in quick, virtuosic figures. Arriving decades later, the Fifth and Sixth Capriccio are more like occasional pieces: Material from Bellini’s I Puritani is obscured in the fifth Capriccio, and the minute-long Sixth builds from A and B-flat, letters in Bussotti’s name. The first Serenata was written when the composer was 18, and had just discovered Schoenbergian serialism. It’s a somber 27-minute essay, slowly paced as it explores an expressive dissonant language. Some parts do plod and grind, as if Togni was afraid to take his new skills onto the highway. 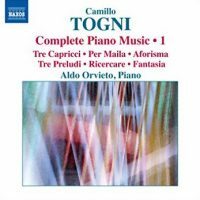 Written just four years later, the fluid Preludes reveal Togni’s complete and personal assimilation of 12-tone music through expressive bursts. The First Partita emphasizes cadences, and in Meine Seele erhebt den Herren (BWV 648) melodies move with octave transposition. Like Busoni, Togni spreads Bach across the piano’s full range. “Complete Piano Music. Vol. 3.” Camillo TOGNI: Serenata No. 3, Op. 13 (1941); Serenata No. 6, Op. 19a (1943); Serenata No. 7, Op. 20 (1943-44); Sonatina, Op. 26 (1945); Omaggio a Bach, Op. 32 (1950/51)*; Tre fantasie scherzose (parafrasi di musica leggera) (1967)*. Alban BERG: Lyric Suite: Allegretto giovale (1925; arr. TOGNI, 1949). Aldo Orvieto, Fausto Bongelli* (pno). Naxos 8.573430 (1 CD) (http://www.naxos.com/). These later three serenades reveal Togni passing through Berg’s orbit in the 1940s: No. 3 is compact and lyric, No. 6 grows mechanical as its small cells generate energy, and No. 7, the longest of the sequence, revels in tight motivic handling and a wide expressive range. The Sonatina steps stylistically sideways towards Neo-Classicism. The two-piano Omaggio is properly serial, its stratagems fully expressed in the concluding six variations. Berg returns explicitly with the four-hands arrangement of the Lyric Suite’s first movement. 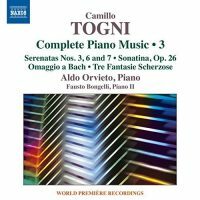 If Togni takes similar liberties as he did with Bach and Mahler, it is harder to tell. The fantasie scherzose represent a different phase and style, suggesting late afternoon improvisations based on popular tunes, rich Romanticism drawing from Rachmaninoff and Busoni. Mario PILATI: Suite per pianoforte e archi (1924-25); Bagatelle, Libro I (1934); Bagatelle, Libro II (1935). Giovanni Nesi (pno), Orchestra Nazionale Artes, Andrea Vitello (cond.). Tactus TC 901602 (1 CD) (http://www.tactus.it/). 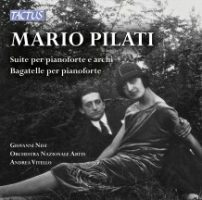 The music we have from Pilati’s short life (1903-38) points to an abandoned pre-WWII direction. The Suite for piano with strings is both neo-Baroque and rustic. The opening phrase emphasizes a trill and a motivic restatement from major to minor. Bold splashes of jazz and antique harmonies interleave with passionate melodies. Pilati does not deny the Italian operatic tradition. There were several points (in the Finale and in the Minuetto in rondò) where emphatic percussion would not have surprised. Tcherepnin’s Batagelles, Op. 5, come to mind – not just because the disc is fleshed out with 11 such examples Pilati penned a decade later – but because Tcherepnin had also been searching for different harmonies. Pilati’s Bagatelles are charismatic period pieces, reflecting a bit of Stravinskyan parody (Marcia, Rococò), Mussorgskyan caricature (Ninna Nanna, Floreal Polka) and lounge tunes (Canzone a ballo, Barzelletta). These are the sort of small moments Couperin would have fashioned into Ordres. Nesi commands this music, finding its uniqueness. Gian Francesco MALIPIERO: Bizzarrie luminose dell’alba del meriggio della notte (1908); Impressioni (1914); Armenia (1918); La Siesta (1920); Tarlo (1922); Hortus Conclusus (1946); Variazione sulla pantomime dell’Amor brujo di Manuel de Falla (1959). Sabrina Alberti (pno). Tactus TC 881302 (1 CD) (http://www.tactus.it/). Let us not forget that Malipiero (1882-1973) was crucial in bringing to light the first critical editions of Monteverdi and Vivaldi. His own music draws from French and German influences, yet remains conservative despite momentary Impressionistic forays. A title like Bizzarrie luminose dell’alba del meriggio della notte ought to promise great vistas, but in retrospect we see Malipiero trying out modern gestures and then returning them to the shelf. Armenia, a “symphonic treatment of Armenian tunes,” allows Malipiero to flirt with exoticism before circling safely home. La Siesta begins with potential atonal energy, but the material is treated like a curiosity. There are Impressionistic colors, but the composer does not yield to corresponding harmonies. Dissonant outbursts in Tarlo are petulant, momentarily colorful and quickly overcome. Malipiero appears to have become more Classical as he aged. Hortus Conclusus is severe: These flowers are walled off from external influences.